Last week we went over attacking the Cover 2 scheme, which is to look for the mismatch on the field (read where the safeties will bite to) and to attack where the safeties aren’t in a position to make a play on the ball or the receiver. Today’s post is a little more of a Zen game–attacking at the path of least resistance. In this case, outmaneuver your opponents and hope for the desired outcome. Here we have Cal down 10-7 after a huge Bell run sets up a Cowan TD play. 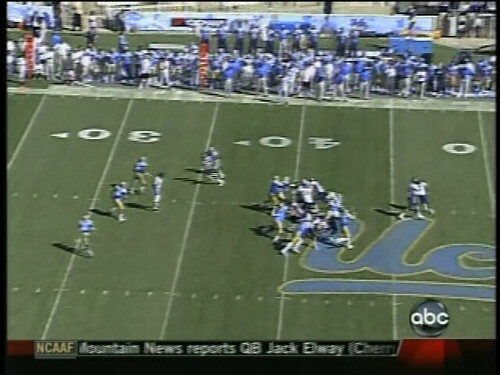 Bears are in UCLA territory, 1st and 15 at the 39 after a penalty on Mike Gibson. 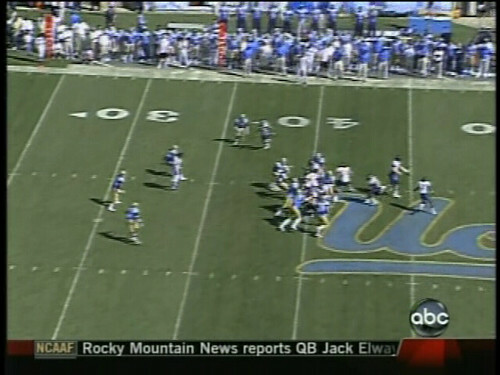 You have Jackson lined up top, Hawkins on the bottom lined next to the fullback Ta’ufo’ou. Stevens is also lined at the bottom, so you have three receiving options (one middle, one short, one deep) to the left side of Longshore. Here’s a press box view of the field. 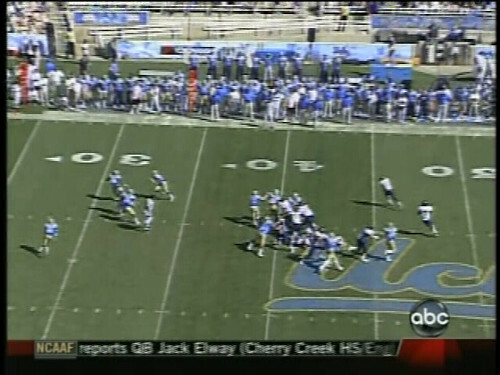 Now, UCLA is lined up in what appears to be a 5-2 scheme, a defense designed to watch for the run attack. 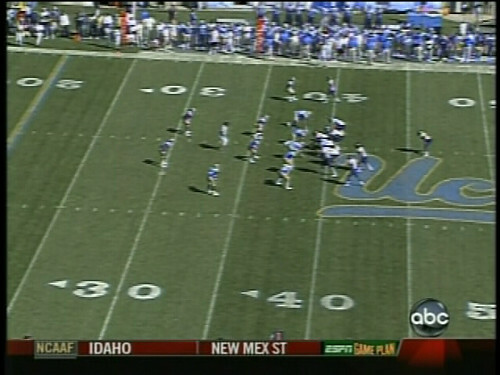 It’s a strange format to be in on 1st and 15 on your side of the field, but Dewayne Walker seems to be playing on a coach’s bias to run on 1st down (although Cal would only run on about 57% of their first downs, a pretty low number). 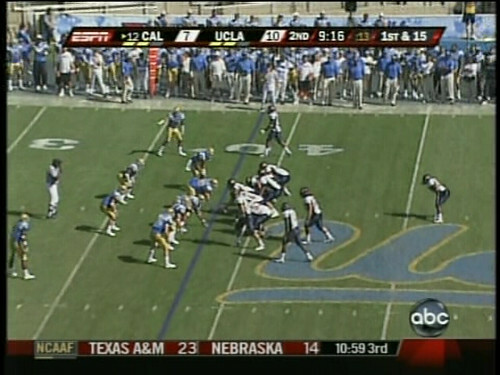 If you’re an offensive coordinator, this is a situation that begs pass. And also Hawkins! While Tedford couldn’t have forseen a 5-2 defense, he sure as hell could have made the defense bite on a run play (Cal has used Forsett and the reverse all year to their advantage or disadvantage, so why not utilize it here?). On 1st and long, defenders often believe the longer field puts them in a strong position, when in reality the offense should be taking advantage. Especially in opposing territory, what’s more unconventional than to go for the home run off the bat? With Hawkins moving past Longshore, it seems everyone BITES on the fake reverse (Jackson isn’t visible, but he’s sandwiched in between those three D-backs. 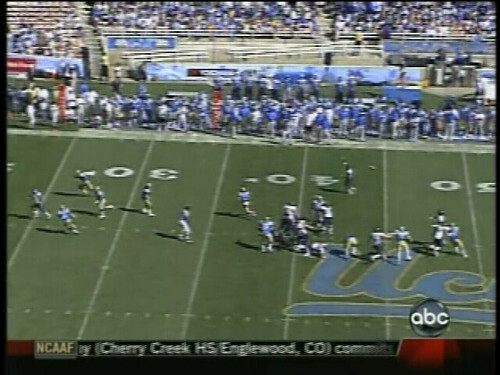 You can see almost every UCLA defender moving forward towards the ball. This is despite the fact that the most dangerous threat on the field is zooming right past them, with only the corner on the bottom side of the picture picking up the target of the play. This is especially important for a QB like Longshore, who relies mostly on accuracy and strength rather than mobility and adjustment. 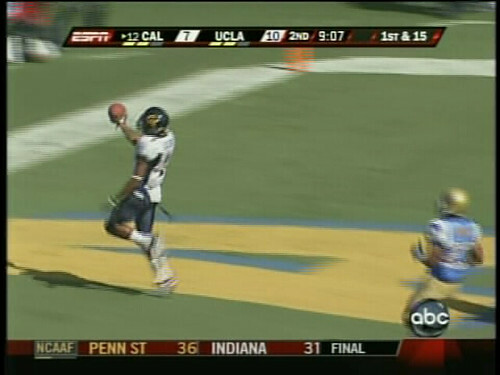 If the safeties are behind the receiver (as they are on most of his deep scores), you can sew up six. Outsmarting the defense is what will make the quarterback’s job easier in the pocket, and Longshore couldn’t be happier to see DeSean deep and open. Touchdown Jackson! 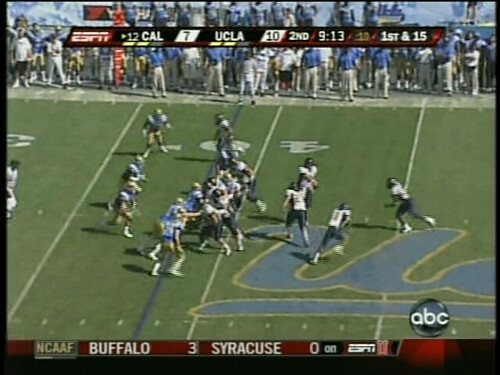 And Cal retakes the lead without a defender touching Nate or DeSean. This is pretty simplistic gamefilm analysis, but hopefully I can come up with more insightful commentary as I parse through the tape. Here’s actual live video of the whole play.